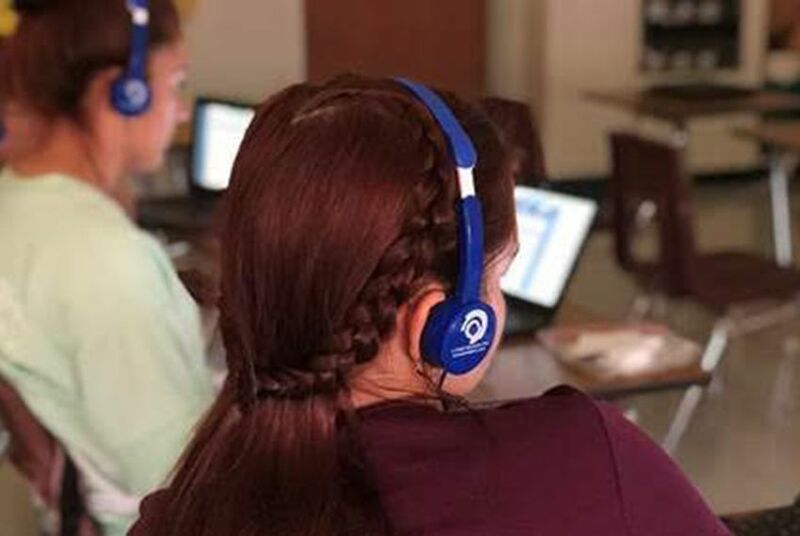 Editor's note: This story has been updated to clarify that Proximity Learning equips students with individual headsets to communicate with virtual teachers. The Ector County school board, which oversees Odessa and its western suburbs, will consider a proposal Tuesday to contract with “virtual teachers” through an Austin-based company, Proximity Learning. As the oil boom has caused the cost of housing to soar in the area while simultaneously luring teachers away to high-paying energy jobs, Ector's school board is considering the remote educators in order to fill some of its 240 vacant teaching positions. About two dozen other school districts use Proximity, with math and American Sign Language as the most common subjects, a spokesperson for the company said. Under a current proposal, Ector County would pay nearly $1 million to offer live lessons projected onto classroom screens and transmitted to individual devices for a wider variety of courses including astronomy, Algebra 2 and English 4. Adkins, the district’s spokesperson, said virtual teachers may be especially useful for courses like American Sign Language, which is offered in two high schools as a foreign language. There is no ASL-certified teacher on staff in Ector County this year, and dozens of students need to take ASL 2 to complete their language requirement. For one year-long course, a virtual teacher would cost $59,400, according to the proposal. The school would also need to hire aides to oversee each classroom in person and pass around a microphone for students to ask questions. Aides would receive $17,363 annually. An entry-level teacher in the district receives a $47,500 salary. With district-wide enrollment at an all-time high — Ector County added 1100 students this fall — schools have also been suffering from overcrowding. A photo of students sitting on buckets at Permian High School went viral in recent weeks when the class' teacher, Madison Bolten, brought them in order to accommodate her large class size. Adkins said Ector County has recruited teachers year-round in Mexico, Spain and far reaches of the U.S., including Michigan and Puerto Rico. It has also partnered with Odessa College, a local two-year college, and Texas Tech University on a “grow your own” program that would provide local students with mentoring and teacher certification in three years if they commit to teaching in the district. And as the average rental cost in the county shot up almost 40 percent in a year, Adkins said, the district has even secured 48 units of rent-controlled housing for its teachers. But it’s still not enough, he said. Abalos said that a virtual teacher may be necessary for specialized courses like Russian, astronomy or American Sign Language — but only if the district is able to provide each student with an individual computer to more directly interact with the instructor. Donna Smith, the school board’s vice president, said she would rather institute a similar system that relied on local teachers, rather than outsourcing them out of Ector County. “If we’ve got the technology to do it remotely, theoretically we ought to be able to do that with a teacher across town,” she said. Smith said she is also concerned about the fact that the virtual instructors would fall outside district’s oversight, and would may not be able to check in as directly — if at all — with other Ector teachers responsible for the same subject or grade level. Still, she’s not ruling the virtual plan out entirely, she said. Disclosure: The Texas Tech University System and Odessa College have been financial supporters of The Texas Tribune, a nonprofit, nonpartisan news organization that is funded in part by donations from members, foundations and corporate sponsors. Financial supporters play no role in the Tribune's journalism. Find a complete list of them here.